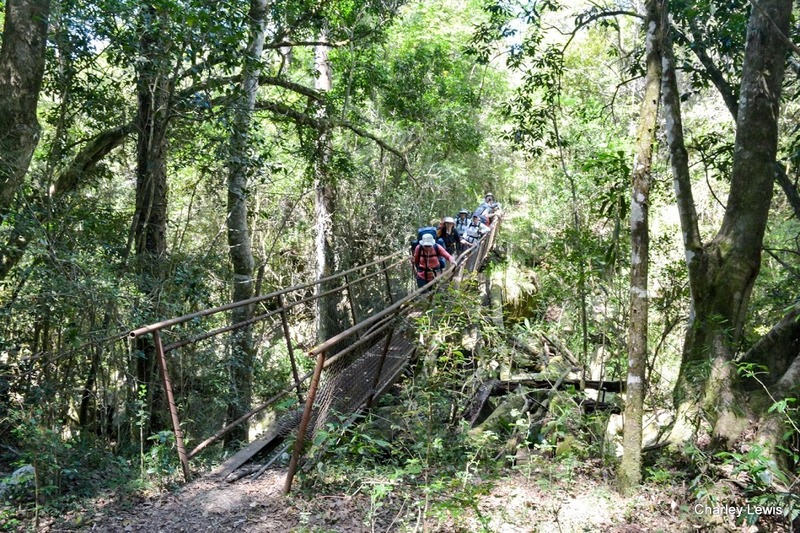 The Amatola Trail is reputedly the toughest and best hiking trail in South Africa. 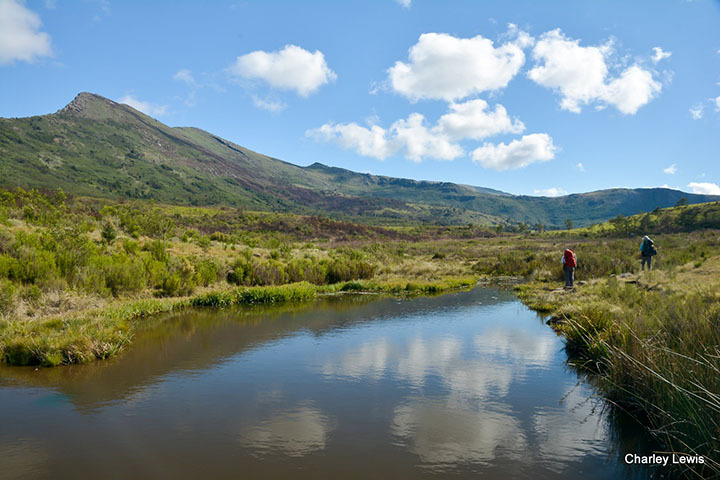 A Six day and five night hiking trail starting at Maden Dam near King Williams Town, traversing the incredible Amatola Mountains and ending in the iconic village of Hogsback. 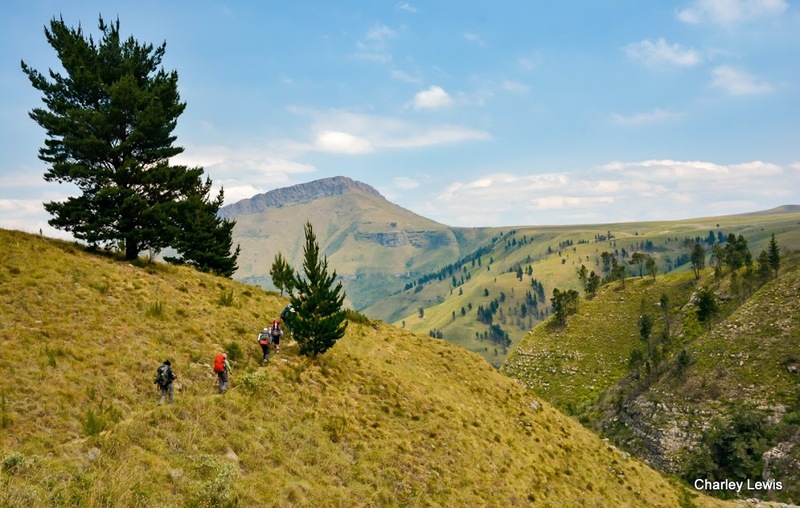 The trail is truly amazing and very strenuous so one needs to be prepared, however the views, remoteness, pristine indigenous forest and endless waterfalls make it one of, if not the, best hikes in South Africa. You must be fit and capable of hiking a minimum of 10 hours a day, never knowing what Mother Nature might throw at you. 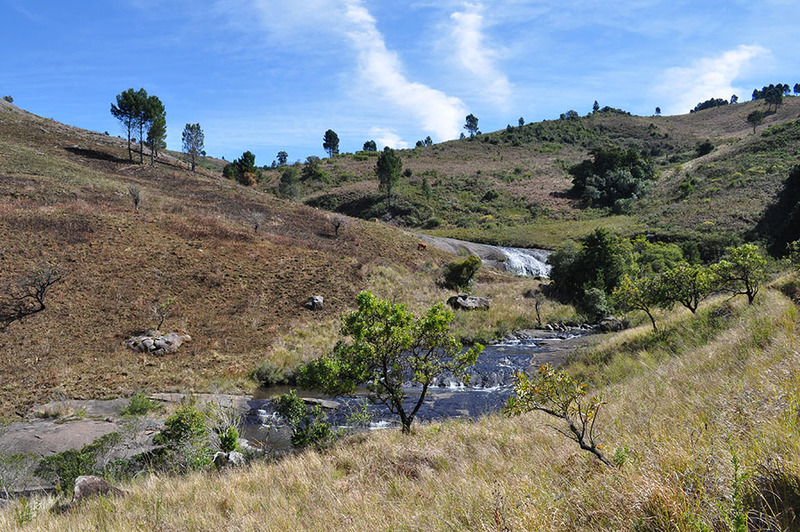 The Zingcuka Loop hiking trail starts and finishes in Hogsback and takes two days and one night to complete. This is an incredible trail, but not to be underestimated. Very tough and very long, this is for experienced hikers, but it is absolutely incredible for those without a full 6 days at their disposal. 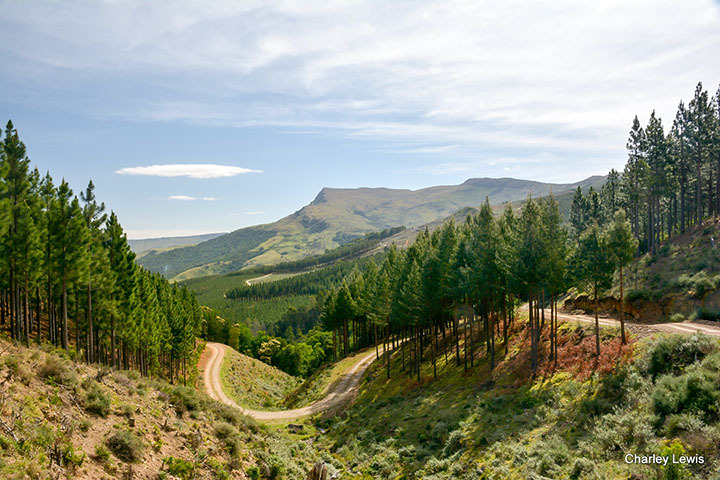 The beautiful village of Hogsback is the perfect place to safely base yourself before and after your epic Amatola adventure as it is the end point of the full six day Amatola Trail, and the start and end point of the two day Zingcuka Loop. 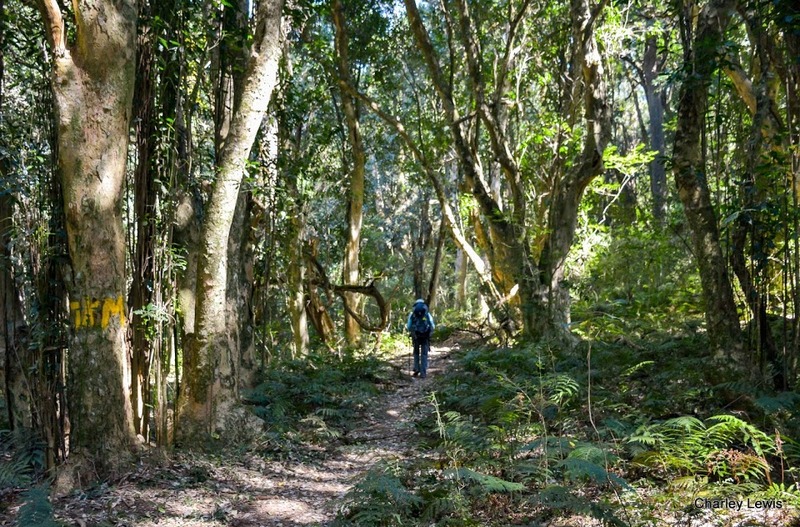 The Amatola Trail is owned and maintained by The Department of Agriculture, Forestry and Fisheries (DAFF), so all hikers require a permit. We offer Packages to make the toughest hiking trail in South Africa a whole lot easier, We provide Hiking Permits for the 6 Day 5 Night Amatola Trail and the 2 Day 1 Night Zingcuka Loop, Accommodation, Safe Parking, Hikers Assistance and 10% discount on all food and bar at Away with the Fairies. If you don’t need everything in the package then choose any part of it, along with extras such as Airport Pick up and Supply Drop offs, and a hopefully never to be used Extraction Service. 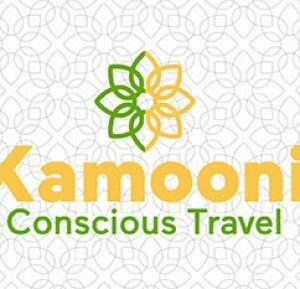 The concept is to book your package through Amatola Trails, and have your permits organised and waiting for you at Away with the Fairies the day before you begin the trail. Accommodation at Acorn House or Away with the Fairies the night before you start and waiting for you on your return. The shuttle to the start of the trail departs Away with the Fairies on the morning of the hike and you can safely leave your vehicle with us for the duration of the hike. We offer Hiker Assistance which entails giving a Map Briefing before you set off and then being on the end of a phone (or whatsapp) in case of problems during the trail and assisting you in sorting any problems out. We can tailor your hike to specific requirements as a series of EXTRAS and EXTRA EXTRAS. We can collect you and drop you in East London Airport and hopefully integrate this into the Away with the Fairies regular shuttle and if not offer a specialised pick up and drop off. We can drop off provisions at Dontsa and Zingcuka Huts to offer a slack-packing option of sorts and an extraction service if a hiker cannot continue or has to leave early for any reason. Because we can book this all in one go, we can give a very good, discounted price to make it very affordable too. Day 1 is the shortest day of the whole trail, and the only day you don’t need to set off at Daybreak. Get our shuttle to Maden dam and then climb over 700m through the Pirie indigenous forest, leaving the world behind for 6 days of bliss. You may notice what looks like fresh dog poo everywhere, don’t panic, it’s digested soil from giant earthworms and they often grow to 1m in length and the largest in the world was found nearby measuring 3.2m. Gwiligwili Hut is perched on top of a hill with views forever and an excellent separate braai area and lovely hot showers. Day 2 looks a relatively easy day as you traverse through indigenous forest the entire distance with the Keiskammahoek valley below, but don’t be fooled. It’s a long day of undulations which can be exhausting for the less than fit. Dontsa hut is in one of the few patches of pine plantation that you will pass through. Pine on one side and indigenous forest on the other. It is simpler than the other huts but cosy and inviting with a wonderful fireplace, hot shower and an impressive waterfall below it. This is a very long tough day, with lots and lots of outstanding views to make up for it. For the first time you leave the indigenous forest behind as the trail ascends to the plateau, where macchia grassland and a myriad of wildflowers grow. Be careful of the waterfall at the 4km point if there has been any rain. You go through the Hovald forest and then descend past the Cata Forest Station and then climb 550m of ascent in 5km through the absolutely stunning Waterfall Forest. The 2nd shortest day starts with a 600m steep ascent to Geju peak(1880m) the highest point reached on the trail. There is an alternate route which bypasses the peak if it is misty but if not the awesome views are worth the extra sweat. Cross over a meteorite site and then after 8km in the open you begin the steep descent into Mnyameni gorge and the Malan forest. A good day to relax and swim in the many rock pools in Mnyameni gorge as you have more time than the other longer days. Mnyameni Hut is the most isolated hut and doesn’t have running water at present, but there is a stream 10m away where you can wash and drink (not in that order). Another tough day with the trail rising and falling 400m. There are many swimming places on this day so get a really early start to make the most of them. Most of the day is out in the open except the last few kilometres through the dense wolf river forest, so the pools are warmer and more inviting than usual. Zingcuka hut is truly special and has a donkey boiler to ease those tired bones. The last day begins with another series of fantastic waterfalls in the Schwarzwald forest before a long ascent of 800m to the main Hogsback peak (1845m) and then descending into the Tyume river basin and the end of the trail. 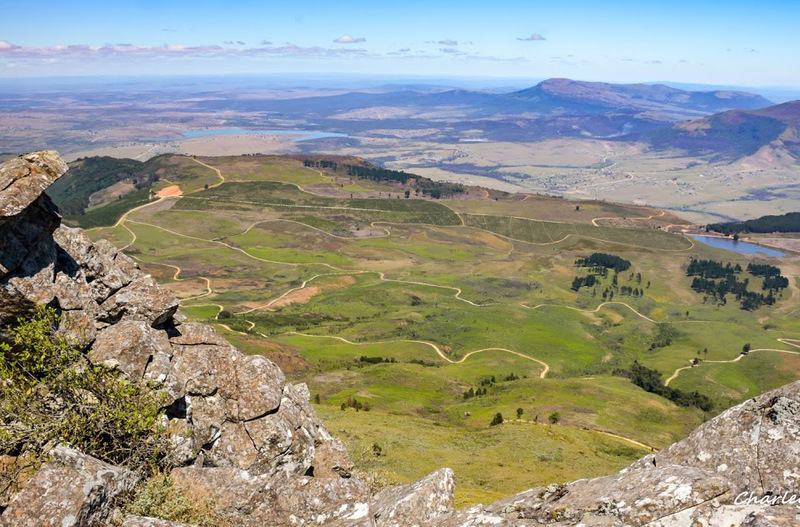 You can easily walk the 4km to Hogsback and Away with the Fairies or hitch a lift. 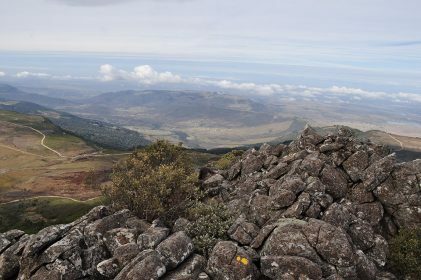 This is another very long tough day, but the views from Hog 1 showing the previous 6 days hike and then forward to Hogsback are absolutely incredible. A WORLD CLASS DAYS HIKING. With more ascent than any of the 6 days of the main Amatola Trail, you have to set off from Away with the Fairies very early and hopefully get a lift along Wolf Ridge Road to (the end point of the 6 day trail / start of the 2 day trail) just past Madonna and Child Waterfall. Follow the stream up a ludicrously steep path and then hike between Hog 1 and Hog 2 Mountains. Follow the footprints to meet up with Day 5 of the Amatola Trail, following the stream to waterfalls and swimming holes. You then walk along the edge of a precarious cliff path with breath-taking views and then down an steep precipice to the stunning Indigenous Forest and onto the Zingcuka Hut to overnight. This day is around 22km, and very strenuous, through intense terrain and at high altitude. 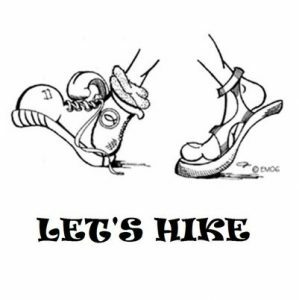 It must only be undertaken by fit and well prepared hikers. Leave from Away with the Fairies, hike through the Auckland Nature Reserve, then around two contour paths with valley views, and down a forestry road through Eucalyptus and then indigenous forest to get to the Zingcuka hut. Spend the night at Zingcuka Hut in the indigenous forest. This route keeps a low altitude so avoids the worst of any inclement weather, while it is also easy to pull out most of the way around if there is injury. Day 2 is the final day of the 6 day trail. Set off as early as you can, low in the indigenous forest at Zingcuka Hut and work your way up the back of Hog 1 Mountain. You skirt the side of the peak of the mountain then work your way down the face. The views are unbelievable. You find yourself following a stream down a steep mountain pass with its many waterfalls and swimming pools to the end of the 6 day trail. Those staying at Away with the Fairies, if they have time, may opt to hike through the Auckland Nature Reserve visiting Madonna and Child, Bridal Veil and Swallow Tail Waterfalls and The Big Tree to end up at the hostel. This makes a big days hiking huge. Alternatively follow Wolfridge Road back into Hogsback. This is a long days hike too, over high altitude prone to adverse weather conditions and with a lot of hard hiking both up and down a mountain. Once you are on the advanced trail there is no exit other than the beginning or the end of the trail. If the weather is bad on either Day 1 or Day 2 then the Beginner / Bad Weather option mentioned above is advised, even if you do it both days (day 2 in reverse from Zingcuka to Hogsback). Both day 1 and day 2 are in high altitude (apart from the beginner / Bad Weather option) and will be in clouds if the weather is bad, so both days should only be attempted in perfect weather conditions. Both days are also extremely strenuous so should only be attempted by people with a reasonable level of fitness, with suitable hiking gear and carrying all their supplies. Book your Permit, Pre and Post hike accommodation, shuttle to the start of the trail, safe parking for your cars and hiker assist – all in one go – and get a Much Better Price than paying seperately! The Amatola Packages gives a permit for the full 6 day/ 5 night trail, 2 nights pre and post hike in en-suite accommodation at Striders Cottage, 8 and 4 bed Dorms at the wonderful Amatola House or camping, shuttle to the start of the trail, safe parking and our assistance package. Students and Scholars receive a large discount, but must supply a copy of each students Photo ID before payment is made. The Zingcuka Package gives a permit for the 2 day/ 1 night trail, 2 nights pre and post hike in en-suite accommodation at Striders Cottage, 8 and 4 bed Dorms at the wonderful Acorn House or camping, lift to the start of the trail, safe parking and our assistance package. Amatola Trails offers only a service and no physical product. Amatola Trials works as an independent Booking Agent linking Hiking Permits, Accommodation, Shuttle Services, Parking Venues and offering advice for the Hikers Assist and as such cannot be held responsible or liable for any injury, death, loss, cancellation or unforeseen circumstance coming from any of these products for whatever reason or under whatever circumstance. The cancellation process for permits is a long and tricky one involving lots of paperwork that needs to be processed. 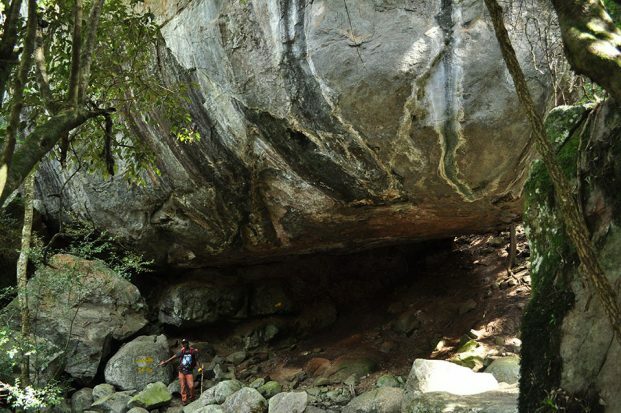 The policy of The Department of Agriculture, Forestry and Fisheries and Amatola Trails is to give a 75% refund on all cancellations made before 30 days of the commencement of the hike. Any cancellations within 30 days of the hike result in all payments being lost. Neither the Department of Agriculture, Forestry & Fisheries nor the booking office or Amatola Trails are responsible for providing a backup service for any hiker/hiking group getting into difficulties nor hikers must plan accordingly. The only circumstances under which the reservation office will become involved are explained in the covering letter. No refund of booking fees will be made if the hiking trip is canceled less than 30 (thirty) days before the hike begins. 75% of the booking fees will be refunded if a booking is canceled at least 30 (thirty) days before a hiking trip begins. Parking areas are indicated on the map but vehicles are left at your own risk. No vehicles may be parked at or near trail huts without having acquired prior approval. You may start your hiking trip only at an official starting point and may stay overnight only in overnight spots provided for this purpose. A hiker may use only one mattress and one sleeping bunk in a hut. Hiking is permitted only in the direction indicated on the map. No pet, riding or pack animal, motor or mountain bikes are allowed on hiking trails. No hiker may deviate from the marked route, even though it could differ from that indicated on the maps. Litter, refuse or empty containers should be carried along and not be left, thrown away, dropped or buried on the hiking trail, please use the refuse containers specially provided for that purpose at the huts. Plants, trees, rocks or works along the hiking trail must not be tampered with or damaged by carving, scratching or marking. Wildlife and vegetation may not be disturbed or removed. Any hiker must leave the hiking trail and overnight spot in an orderly condition. Any hiker uses the trail and overnight spot at his/her own risk. There are no places marked as dangerous on the trail, but hikers must use their own common sense, as to what could be dangerous under what circumstance and act accordingly. Fires may be made only at overnight spots where the necessary facilities exist. Any hiker shall be liable for any damage to farm and forest products and other property along the route of the hiking trail that may be caused by fire or otherwise as a result of any act on the hikers part. No liability whatsoever shall attach to the State or the Trail Management for any damage to any property of the hiker by any of the State’s Trail Management’s officers, employees, vehicles of animals, or resulting from any operations carried out by or on behalf of the State or Trail Management, or through any other cause whatsoever, unless such damage is caused by negligence on the part of the State’s or the Trail Management employees in the execution of their normal duties. Any hiker indemnifies the State the Trail Management and Amatola Trails against any claims and/or legal proceedings instituted by himself/herself or any third party which may arise from his/her entry to the hiking trail and undertakes to compensate the State the Trail Management or Amatola Trails for any costs which may by incurred in opposing such claim and/or legal proceedings. Chapter 5 subsection 40(a) to (h) of the Ciskei Nature Conservation Act of 1987 is fully binding on all hikers. 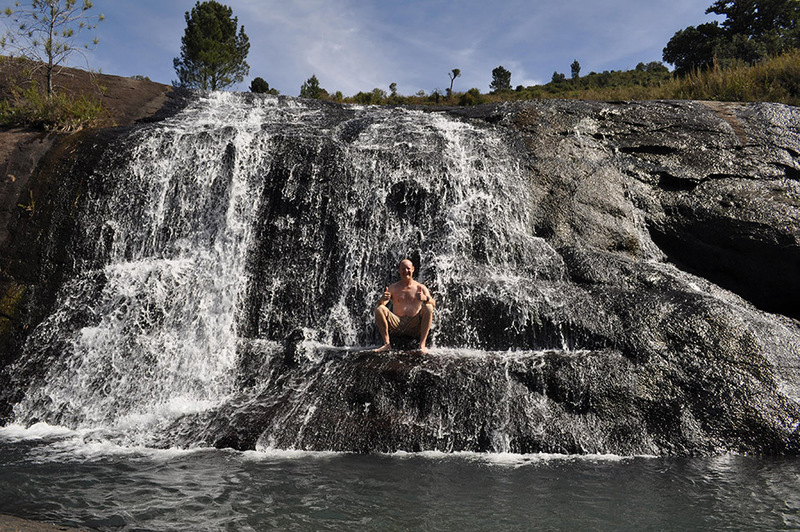 With it’s world famous bath on the edge of a cliff and friendly staff Away With the Fairies Backpackers is your best destination for a fulfilling Hogsback experience.